New seasons always bring new faces to the studio. This fall, that includes our new production studio specialist Seth Grabow. 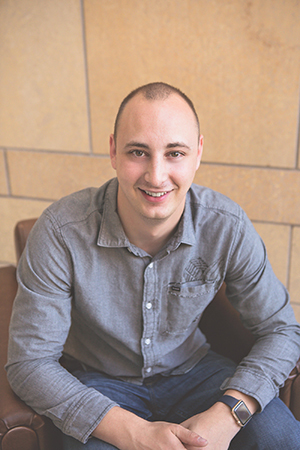 Originally from New Sweden, Minnesota, Seth graduated from Bethany in 2014 with a major in communication and emphases in intercultural communication, public speaking, and music communication. He also minored in sociology where he focused mostly on gerontology (the scientific study of old age). A strong technical background has prepared Seth to manage the equipment room. He’s particularly knowledgable when it comes to audio and is eager to work with students on how to capture and manipulate audio to give their video projects an extra edge. In fact, one of his dream jobs is becoming the worlds next Ben Burtt—the guy who does foley for major films such as Star Wars, Indiana Jones, and WALL-E (foley is the reproduction of everyday sound effects that are added to film, video, and other media in post-production to enhance audio quality). Some of Seth’s favorite memories from being a student here include making movies for Red Eye Film Festival and helping with audio for campus events. Other personal and professional interests include landscape photography, video production, working on creative teams, and being apart of the production crew at concerts and other live events. Seth has dabbled in stand-up comedy and has won the fan favorite vote in two open mic nights in the Twin Cities. In 2008 Seth was (unofficially) in the top 10 players in the world for 100% completion of Super Mario Bros, consistently posting times around 1 hour and 17-18 minutes. The current world record is 1 hour 10 minutes and 34 seconds. His best time ever places him 15th in the current standings according to the official video game world record website, speedrun.com. In 2012 Seth was one of a few winners who beat 4,000 other entrants in an online DJ competition, earning him the opportunity to perform at Summer Set Festival in Somerset, Wisconsin. A few thousand people attended this event at which he got to meet some of his favorite artists and performers. Welcome to campus, Seth! We’re excited to have you in the studio and ready to put you to work. If you haven’t met him yet, stop by and introduce yourself. He’s quite ready to assist you with projects or beat you at foosball. Great on you, Seth! Excited that you’re helping BLC put its tremendous audio potential to good use!